Dress for Success Dublin campaigns at all levels of politics, industry and civil society for full workplace equality. It is our aim to help realise workplace equality here in Ireland, drawing on our political and business networks and the feedback we receive from our clients. Since November 2016, we have staged an annual, month-long campaign to raise awareness of the gender pay gap and related issues. This year, we’ll be highlighting the gender pay gap with a day of action on 13th November, the day on which women in Ireland stop earning, relative to men. That’s because the current gender pay gap of 13.9% means that woman in Ireland effectively work for free for the last 50 days of the year, when compared with their male counterparts. 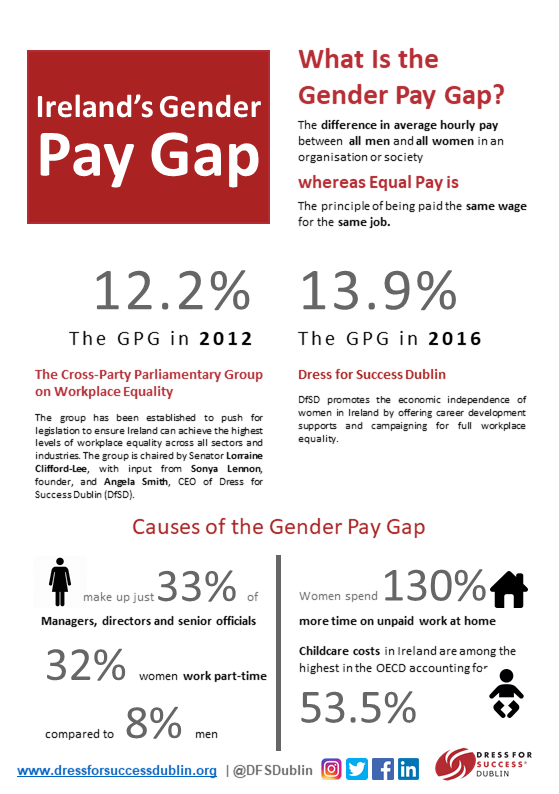 Check out our info-graphic on the Irish gender pay gap here. A day of action in Leinster House on the 13th of November engaging members of the Oireactas and raising awareness of the gender pay gap, workplace equality, and most importantly, the solutions! ‘Banter’ panel discussion, hosted by Jim Carroll, at The Liquor Rooms, Dublin, on 13th November. On the panel – Sonya Lennon, Senator Lorraine Clifford-Lee, Mark Paul and Deborah Somorin. More info and tickets here. A study trip by the cross-party group parliamentary group on workplace equality to the European Parliament. The objective is to find out about best-practice policies and laws in relation to workplace equality, for application here in Ireland.